You can still chip in by purchasing the War Child DLC. This War of Mine launched on PC over four years ago, but DLC and additional platforms has meant that it's continued to show up in my inbox (and my game rotation) a lot since then. In that time, it's managed sell an impressive 4.5 million copies, while also raising $500,000 for the War Child charity. 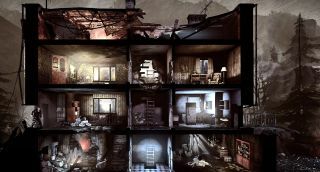 I'm a big fan of This War of Mine not just because it's a gut-wrenching management and survival game full of difficult decisions and emotional crescendos, but because 11 bit Studios gives back to the people who are actually affected by the sorts of things presented in the game. It helps balance out all those times publishers made deals with gun manufacturers. 11 bit Studios created DLC specifically to support War Child in 2015, adding original street art to the game created by a variety of international artists. You can still buy the DLC now and choose from one of three donation/payment tiers, depending on how much you can afford to give. 11 bit Studios' efforts sends out a challenge to other games that craft entertainment out of experiences the depict the lives of people in vulnerable circumstances. Imagine if games with "insane" enemies and haunted asylums donate to mental health organisations, for instance. Charities would be rolling in it. You don't need to buy some DLC to donate, of course. Hop over to the War Child website to find out more.